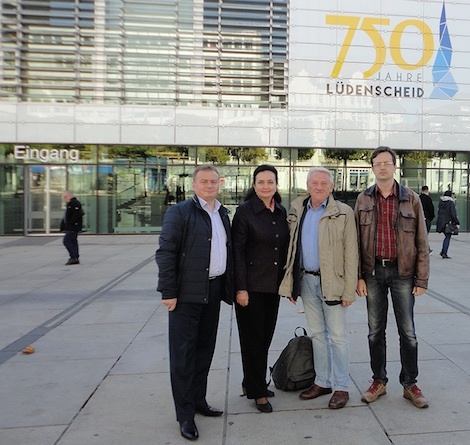 October 11, 2018: official delegation of the city of Taganrog headed by Ms. Inna Titarenko - Chairwoman of Taganrog City Council and City Executive returned the visit to Lüdenscheid, Germany. Other representatives included Mr. Andrei Goloborodko - director of Taganrog Chekhov Teachers' College (former TGPI, now part of Rostov State University of Economics) and Mr. Alexander Mirgorodskiy - Taganrog Foreign Relations Officer. The visit was in connection with the 750th foundation anniversary of Lüdenscheid. Inna Titarenko transmits the congratulatory address to Bürgermeister Dzewas. Last month, an official municipal delegation from the city of Lüdenscheid headed by Bürgermeister Dieter Dzewas visited the city of Taganrog within the framework of 320th anniversary of the foundation of the city of Taganrog. 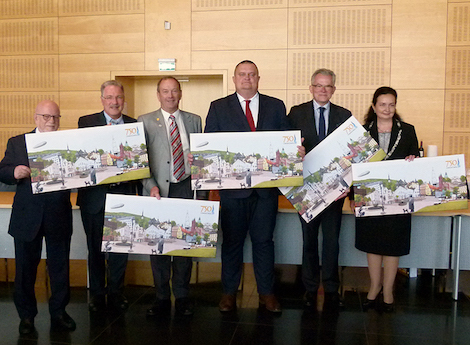 Mayors of Romilly-sur-Seine, Lüdenscheid, Brighouse, Myslenice, Den Helder and Taganrog (from left to right). Besides Taganrog, delegations representing four other sister cities of Lüdenscheid attended the festive events: Romilly sur Seine (France), Brighouse (UK), Den Helder (Netherlands) and Myslenice (Poland). An official reception of foreign guests was held at the assembly hall of Lüdenscheid's rathaus. In her opening remarks, Inna Titarenko highlighted the importance of successful and long-standing partnership and cooperation between the two cities, which extends to education, culture, event tourism, sports and other areas. 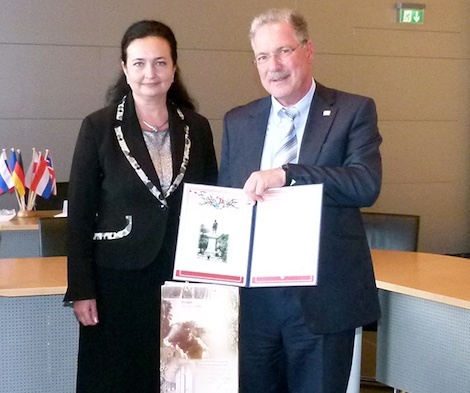 "It is my sincere hope that Lüdenscheid's anniversary will become another starting point for further modern development, continued mutual dialogue, strengthening of international business cooperation between our sister cities", said Taganrog City Executive. Taganrog delegation with Lüdenscheid's long-service employee Mr. Löhn. Taganrog delegation participated in the main cultural project dedicated to the city's 750th anniversary - the festival of light installations "Licht Routen", and laid flowers to the monument at Versetalsperre dedicated to foreign and German forced labourers who worked at the construction of the dam. It is known for a fact that many of them were from the city of Taganrog. In the course of the stay, the city executives discussed the extension of cooperation in the areas of culture and education.